It’s not naughty so just get your minds out of the gutter! A naked cake is constructed without frosting. Our groom didn’t care for frosting. The bride supplied us with a Pinterest post (boy, don’t you just love Pinterest? How did we find anything before it came along?) displaying a cake totally devoid of frosting. The baker in me panicked. The venue was the bride’s family backyard. Lovely and perfect under its fairytale tents but still outside! I feared the edges of the cake would become dry and crisp before service. What to do? We suggested the cake be covered with a very thin ‘crumb coat’ of frosting, sealing in freshness but allowing the rustic look the bride was hoping for. Finished off with plump, fresh berries, handmade hydrangea blossoms and the whimsical wire “Mr. and Mrs.” cake topper it was a work of art! Well, at least I think so! The flavors? I’m so glad you asked! 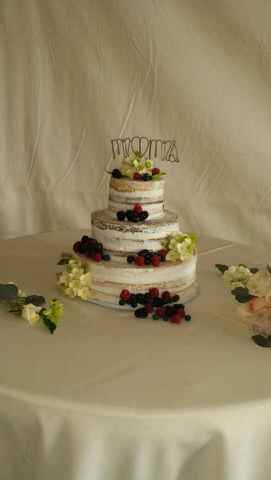 The bottom tier was a three layer Vanilla Bean Cake filled with a creamy Vanilla Bean Pastry Cream. The middle tier was Mocha Cake filled with Bavarian Cream and the top tier was a Tiramisu Cake filled with Mascarpone Filling. Yummy! The cake was a hit with the guests according to the bride’s mom, who kindly texted to let us know. Posted on December 19, 2014, in wedding cakes and tagged naked cake, weddings. Bookmark the permalink. Leave a comment.